Some of the new season Vogues are a joy for people who’re fascinated by how patterns work. The last few pattern issues have been mainly sheath and vintage dresses. I know those shapes are current but I don’t wear them myself and have difficulty working up any interest. Don’t see many people round here wearing them either, even though this is a young university suburb. Many short skirts, leggings and sweaters, but not dresses. Perhaps it’s different at corporate offices or parties in a big city. I’m also becoming interested in flounces – though only in moderation. Anyway, this set of Vogues has so much I want to mention this post got very long. 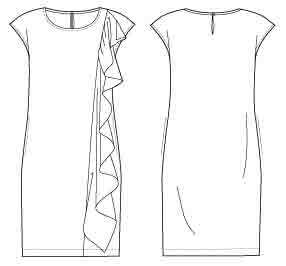 So I’ve made 2 sections, this one on dresses, and another on separates, jackets and bags. 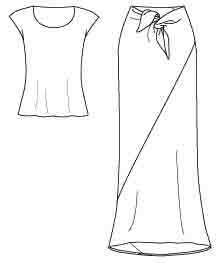 Very Easy Vogue 8806 – similar but with set in sleeves, different yoke placement, and a hood. I can see myself in this as a top or tunic. 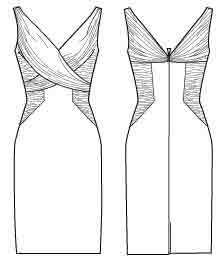 Vogue 1300 – a simple elegant flounced shift from DKNY, another possibility for a top. And another I might wear myself. Vogue 1301 – fascinating options from Koos. Could be a thigh length tunic. Very Easy Vogue 8807 – a simpler version swirling from a yoke. Another I think could make a good top or tunic. Vogue 1302 – close swathes from Kay Unger. Again lovely if you’ve got the shape for it, but not something I could wear myself. Vogue 1305 – oh joy, something really interesting from Lialia. Not for me to wear, but understanding how it works as a pattern gives me great pleasure. Are the two versions actually the same dress with 2 different neck openings ? Wow, a pattern that actually looks better on a body than in a line diagram. But another style that leaves nowhere for a less than perfect shape to hide. Vogue 8813 – drapes from Marcy Tilton. Well, hiding bodies maybe, but Vogue recommends this for the pear shaped. Hmm, thanks but no thanks. I like crafters’ smocks, but wouldn’t feel flattered in this – though I can imagine people I know who have a different body shape and would love this. Are these separates or a colour blocked dress ? 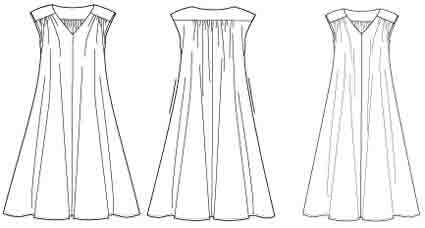 Vogue 1310 – more elegance, in bias lines from Chado Ralph Rucci. Not much I would wear myself, but great pattern interest and pleasure. My second post, about new patterns for separates, has styles I’ll be more likely to wear. Which do you enjoy ? This entry was posted on May 12, 2012 at 4:26 am and is filed under current fashion, my choices. You can subscribe via RSS 2.0 feed to this post's comments. Both comments and pings are currently closed. Very much enjoyed today’s blog, Sewingplum! My favorite is the Chado Ralph Rucci. Thank you for mentioning the potential for using some of these dress patterns for tops or tunics. That rarely occurs to me–I am too literal in considering patterns. Several of the new Vogue dress patterns that seemed ill suited for my pear-shaped figure now seem like good possibilities! I love both the Lialia’s. My only issue is I would have little chance to wear them. I still will likely pick them up at the next pattern sale. 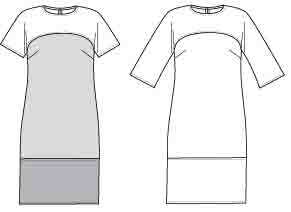 I’m glad you mentioned shortening to top or tunic. I’m not a dress wearer , but I have a ton of dress patterns that I do wear shortened to a top I can wear with pants or skirts! 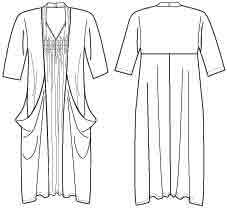 Dresses tend to have far more interesting bodice details and shaping than a lot of top patterns for some reason. Good picks! Sheaths are indeed so boring :-). And also unsuitable for me, not for a sitting-a-lot person. I also very much liked this DK one http://handmadebycarolyn.blogspot.fr/2012/05/unusual-dress.html but I’m afraid it may not from this spring?? Unusual though :-), and could be wearable by me. Although at first glance I’d probably prefer your 8807 on the basis of being coolest (literally). Most of these wouldn’t work for me. I need some sort of waist definition and tent shapes are the worst. 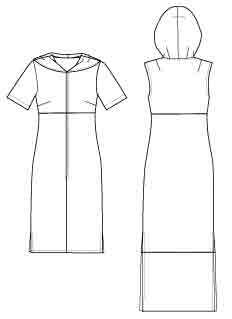 What works for me : wrap dresses, shirt dresses, pencil skirts… I tend to sew simple patterns more and more. I am interested in more complex, clever designs (I am a fan of Madeleine Vionnet), but I find that in real life, simple relaxed classics usually works best for me. I really like the Ralph Rucci skirt, but I may not be tall enough for it. And I too am fascinated by the cut of patterns, though like you the complex ones aren’t right for me to wear myself. Maybe I’m telling my age but I like the Tilton dress (the red one on the vogue site). It would be comfy to wear around the house in high summer. The only thing I worry about are those pockets -since the tops are so drapey and loose, are they deep enough to be useful? I have to have pockets. I live in a farming community. I rarely see dresses or skirts being worn. So I too think this issue was lovely, but useless for myself. I have on occasion converted a blouse to a top, but usually if I look long enough, I can find the same/nearly the same pattern already in a blouse version. Good point Bev. Using patterns is definitely a skill, the more we know the easier it becomes ! I’m wondering if you’ve tried to make McCall’s M6605 (per our discussion above). I am making view C (or trying to) and have gotten to step #17 just fine. The next step applicable to view C is #32 – staystitch the collar, but I don’t see any instruction on assembling the front and back pieces to get to the place where there is a collar (neck hole) to staystitch. Is it me? Or is the pattern’s sewing instruction missing some steps?